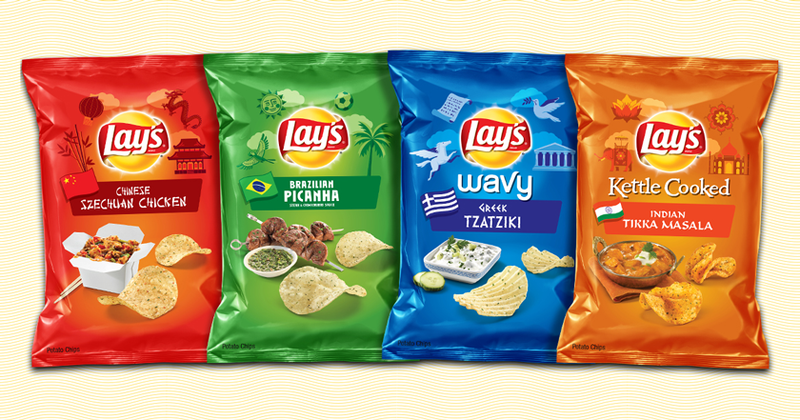 With the 2016 Summer Olympics just around the corner, Lay's takes the opportunity to embrace the international theme by bringing four popular flavors from around the world to us here in the US. - Brazilian Picanha - Picanha is a popular cut of steak in Brazil and known to us as the "rump cap." If you've been to a Brazilian BBQ joint, you'll typically see it sprinkled with coarse salt and grilled on a skewer. 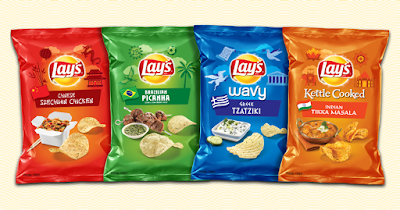 Here, the flavor of chimichurri sauce is also present (having tried steak-flavored Ruffles from Frito-Lay, I'm a bit apprehensive about this one). - Chinese Szechuan Chicken – Sichuan peppers (or rather peppercorns) are distinctive for a tongue-tingling sensation some would describe as "numbing." The potato chips offer the same sensation along with the flavor of chicken. - Greek Tzatziki - This flavor features a mix of dill, garlic and other "unique spices' added to yogurt (Lay's previously offered a gyro flavor and gyros usually include Tzatziki, so this should offer something similar). - Indian Tikka Masala - A tomato-based flavor featuring spices such as turmeric and cumin (This flavor or something similar was spotted in test earlier this year).